In God we trust. I see it, on our currency all the time. What does this mean? To associate God with money? This seems contradictory to most Christian teachings I’ve read. 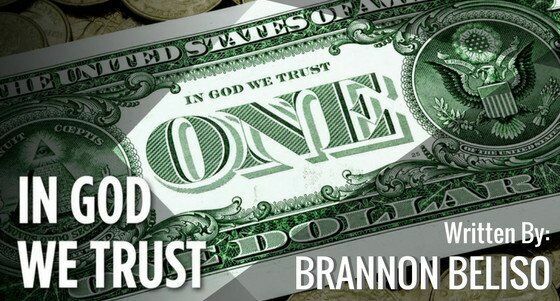 To me, “In God We Trust”, means trusting and having faith in God. I see that faith in the smile of a child or a perfect sunset in Hawaii. It is the happy ending at the end of a movie or when good wins over bad. Faith is the strength God gives me to never give up, and accept life on life’s terms. God is known by different names such as Buddha, Allah, Jehovah or Jesus. No matter the name, to me, having faith in God is the path to inner peace and balance. Faith asks me to surrender my self-will and control to God. It inspires me to always be humble, tolerant, compassionate and forgiving. Where I can’t, God can. When I feel like I can’t go on and want to give up, I give it up to God. This simple act of faith gives me a feeling of peace, knowing that everything will be just as it is should be. This peace offers me clarity. I am grateful each time I wake to a new day and go to sleep with the hope of an even better tomorrow. I am grateful I choose to have faith. I thank God for his love and mercy. I encourage everyone to find their own spiritual path. It is the key to establishing faith in one’s life. In God we trust.